Take Profit EURJPY is a fully automatic Expert Advisor for Intraday Trading. JAPANESE LEVELING is based on two different settings for Bollinger Bands superimposed on the graph. One setting is to open a position and one to close it. 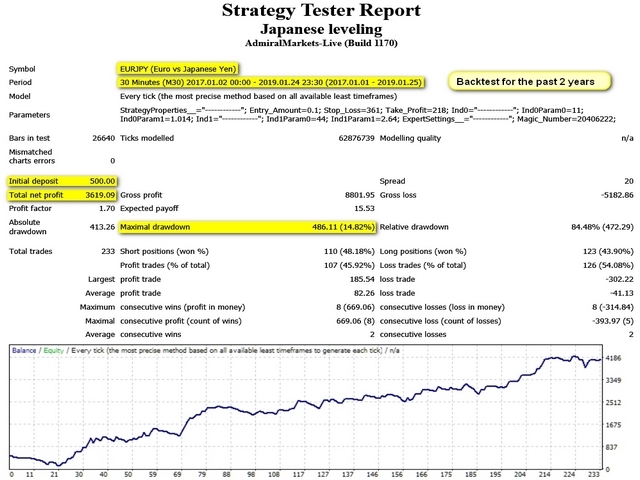 The expert advisor is able to get a very high-rate of winning trades. Only one order with real Take Profit and Stop Loss levels is used for trading, which ensures maximum safety of trading. The Expert Advisor uses the indicator Bollinger Bands to identify the entry and exit points.